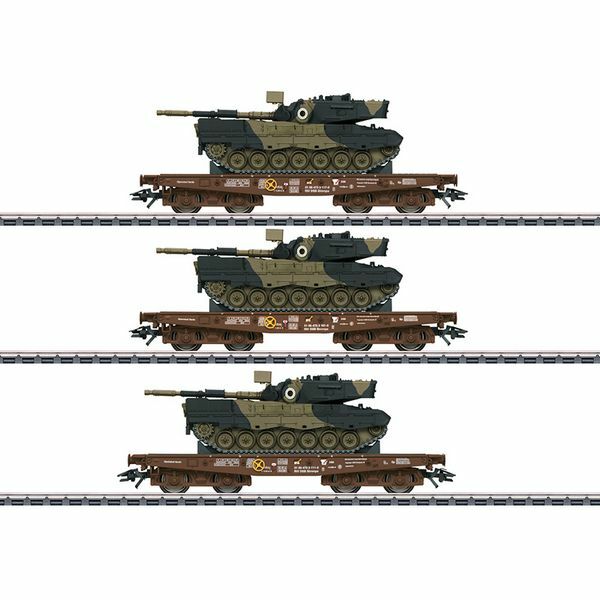 Prototype: Three (3) Danish State Railways (DSB) type Slmmps heavy-duty flat cars, loaded with Leopard 1A5 combat tanks for the Danish Army. Model: The flat car frames are constructed of metal. Load restraints are included. The models of the military vehicle have an underbody and superstructure constructed of metal. Caterpillar tracks and other separately applied components are made of detailed plastic parts. The turret and the weapon can be moved. The units have authentic paint schemes. The units are lettered with identifying marks. The models of the military vehicle come from Schuco. The cars and tanks are individually packaged. Total length over the buffers approximately 37.5 cm / 14-3/4". DC wheelset E700580. Prototypical tooling changes for the Danish Army variation of the Leopard. A diesel locomotive to go with this car set can be found in the Märklin H0 assortment under item number 39677.